6′+ Episode 32 is up! Last year, not only did Pinnacle Entertainment released a free Savage Worlds adventure called “The Wild Hunt,” but they also released a special papercraft model to be used while playing said adventure. Closing out out selection of freebies that we missed out on last year, Green Ronin Publishing released Quick Start rules for their Dragon Age RPG and Eden Studios released a free corebook for All Flesh Must Be Eaten. Pelegrane Press has ton of free goodies. One of our favorites is a Trail of Cthulhu adventure called “The Murderer of Thomas Fell” that comes complete with pre-generated characters. If you prefer to generate your own characters, then this should be of great use for you. Speaking of Cthulhu, Chaosium has blank Call of Cthulhu character sheets and a free “Cthulhu Invictus Bestiae” sourcebook that’s full of monsters for the Cthulhu Invictus campaign setting. Heading over to Google Books yields a lengthy preview of Keith Herber’s The Keeper’s Companion, which offers lots of tips on running a game and stats for Reptile People. Dead Inside is an interesting horror RPG. To paraphrase an article on RPGnet, this RPG avoids the usual “Kill monsters and take their stuff” concept in gaming and opts for a “Heal people and give them stuff” concept. You can find a variety of free downloads for it (and other games) at the Atomic Sock Monkey Press website. In the mood for a grim fairy tale? You can download the free edition of Puppetland here. If you’re in the mood for a comedic horror experience, download Risus (“The Anything RPG“). If you would prefer a horror comedy RPG that’s a little more structured, check out the Quick Play Guide for Monsters and Other Childish Things. Haunted Attic has several free role-playing games from Joe Williams, including Lost Souls. Similarly, the official sites for Little Fears and Dying Earth offer many freebies. Ronin Arts has a fairly simple free game called “vs. Monsters” available for download. JAGS stands for “Just Another Gaming System” and its official website offers a free horror adventure called “Season of Worms,” complete with pre-generated characters. Not only that, but they also offer a free GURPS conversion for said adventure! For those unfamiliar with the term, conversions are a handy way to use adventures for other RPG systems in your system of choice. For example, you could convert the Call of Cthulhu adventure noted above into a GURPS Horror scenario using the information noted here. And by using this unofficial Call of Cthulhu to Deadlands conversion system, you can also figure out a way to convert Deadlands adventures into GURPS (and vice versa)! Google Groups is a very fruitful resource for free gaming materials. In addition to this interesting post on how to reuse preexisting monster stats to create new monsters to throw at your players, someone came up with a homebrew slasher character to use in GURPS. For a quick ‘n dirty GURPS adventure, plop him into a house party (using a map taken from here) and see if your players can survive the night. Make sure to note that the power mysteriously went out for extra chills. If you don’t have any of the dice necessary to try out the above, then these papercraft dice will be of great use to you. Similarly, do you want to try out one of the above games but don’t want to buy a whole notebook of graph paper? Then head on over Incompetech and print out your own for free! There’s plenty of interesting types of graph paper you can choose from, which allows a variety of unusual maps to throw at your players. Some of your might remember last year’s article about using music during RPG sessions. Those wishing to try that should definitely be interested to know that Incompetech also offers an incredible amount of free music. There’s horror music, fantasy music and just about any other genre you can think of. Those seeking old timey music and tracks from exotic locals for their Call of Cthulhu campaigns should consider their search over. Do you have friends that are interested in gaming with you, but don’t live nearby? Then you might want to consider downloading online gaming aids (such as MapTool) from RPTools. If the above somehow isn’t enough for you, then you definitely need to check out this amazing resource for free RPG downloads. 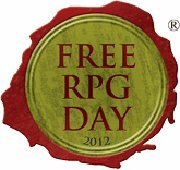 Special thanks to the organizers of Free RPG Day for use of the image! Bad Behavior has blocked 2194 access attempts in the last 7 days.